When your foundation is the wrong color or is applied incorrectly, there is no hiding it. In many different research studies it is said that 6 out of 10 women are applying their foundation incorrectly which can be just as bad as wearing the wrong shade. 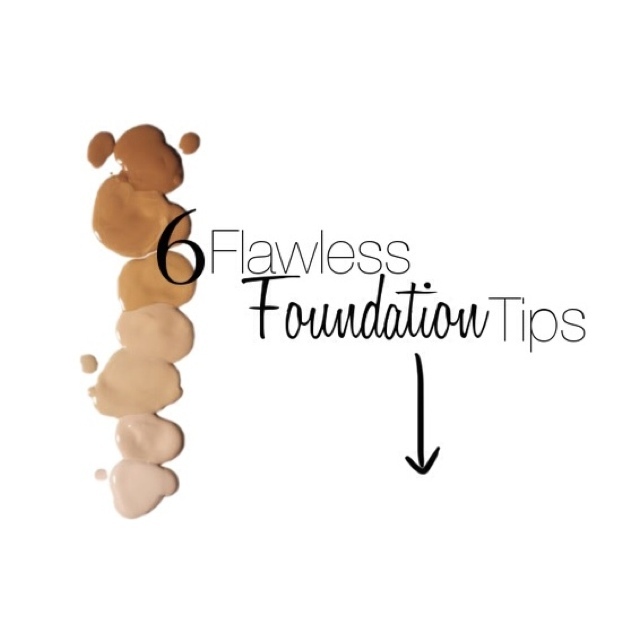 By following these 6 simple tips you will be applying your foundation like a pro in no time! Try using a dome shaped fluffy brush in light circular motions when applying your foundation ($35 MAC #109 Brush). Applying with this technique allows you to use less product but will also help to build coverage. Remember, it is always easiest to build product than to take off the excess. The bad news is that there really isn’t a way to stop products from creasing. However, the good news is that there are ways to help minimize creasing. First, be sure that if you have applied any primer or creams to the areas that have fine lines (under the eye or around the mouth), that you blot away the excess product. The more emollient the skin, the more likely the product will crease. For lines around the mouth, go in with a small fluffy brush & remove any product buildup by buffing gently. Instead of loading the face with powder to get your foundation to stay put, try using a matte foundation ($36 Makeup Forever Mat Velvet +) in the areas that tend to be oilier (typically the T-Zone) and using a dewier foundation around the perimeter of the face. Blend the matte foundation outwards to meet the dewier formula and gently marry the two together. Trying putting on your highlighter before you put on your foundation. This will give you a natural looking glow. With a matte full coverage foundation, throughout the day it can tend to look a little dull. Placing your highlighter underneath your foundation will help to give the skin a glow that looks as if it is coming from within. Time & time again we have heard to blend your foundation below the jawline & into the neck but, there some other places that need some attention as well. Don’t forget to blend down onto the chest area if your chest is showing & if your chest is a different color than your face. Also, be sure to blend your foundation onto the ears and behind the ears as well. Sometimes on lighter skin complexions, ears can tend to be red so make sure to add a little foundation to your lobes & wherever else you see redness. I’ve just recently started wanting to get into wearing highlighter. Your tip says to use highlighter before foundation but I’ve also heard to use after foundation. Are there any advantages/disadvantages from using either way? Thanks for all the tips!!! I love makeup bloggers and tutorials and I’ve yet to find a reliable blogger for women of color so I’m really excite that I’ve found your blog! So glad you love the blog…that makes me really really happy! Highlighting can be done either way, before or after foundation. However, I believe that you are going for a more natural look (i.e. running errands, lunch with the girls, day date) applying a highlighter first will make the brightness/glow look a little more natural, like it is coming from within. That is the only difference in my opinion. I do both ways depending on what look I am going for so try both & see which one better suits you! Happy Highlighting! LIVE Makeup Class in your Bedroom! Contour & Highlighting…Products I Use! Fit Fashionable & Fabulous after the Kids!